1 / 3 — The Anchor Bank addition is seen on the left while the mixed-use apartment building is seen on the right. 2 / 3 — Construction view from the top of an adjacent parking garage. Urban Land Interests acquired the Capitol Square Anchor Bank property in December 2014 with the goal of completing an extensive reconstruction project. This renovation would include the expansion of the office building, demolition of the above grade parking structure, construction of a five-level underground parking structure beneath Carroll Street, and the construction of a mixed-use apartment building containing 8 levels of rental apartments and retail/restaurant space at the sidewalk level. When complete, this building will have a very attractive, modern glass façade and landscaped roof terraces. Hooper Plumbing took on the task of design building all plumbing and site utility work for the property redevelopment. 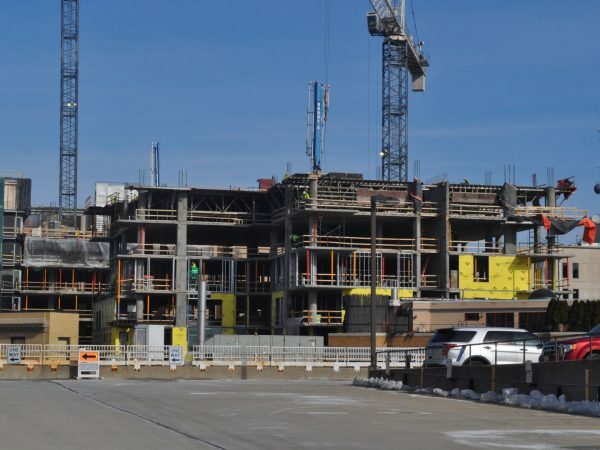 This included relocating and maintaining sanitary sewer, storm sewer, and water services during the construction of the underground parking structure which was under a city street. Crews gutted the existing Anchor Bank office building and replaced all plumbing and fire protection systems. This building footprint was also enlarged with an addition through all nine floors. 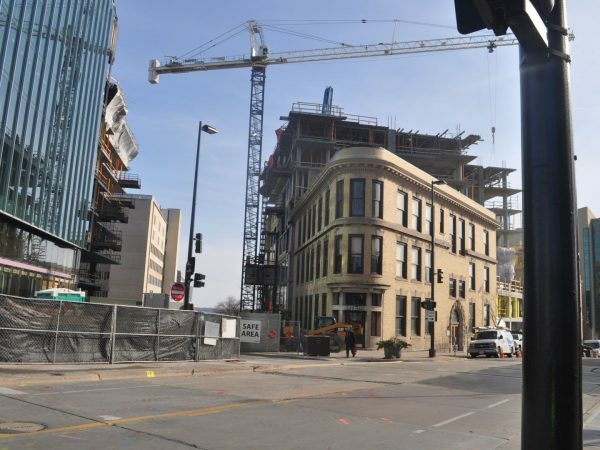 Across the street, Hooper crews took on the plumbing infrastructure and provided full fire protection services to the nine story mixed-use apartment building. 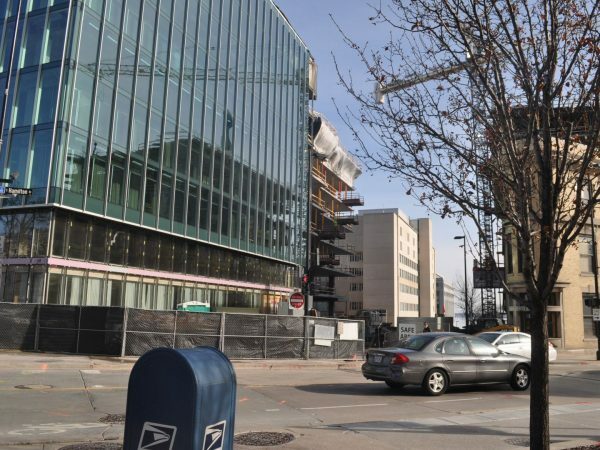 Crews worked with the City of Madison to design and extend Anchor Bank’s site utilities to the new structure as well as to provide grease interceptor structures for each building.